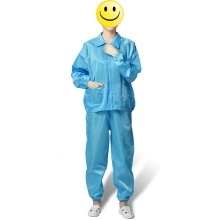 *This is a suit of anti-static protective suit including one jacket and one trousers.Using special polyester filament and high performance permanent conductive fiber by special weaving process, clean clothing made by this kind of fabric through the special sewing process is equipped with excellent and lasting anti-static dust-proof performance. *Anti-static work clothes,which can effectively release human body electrostatic charge,very convenient and practical for your daily use. *Suitable for electronic,food,bio pharmaceutical,paint spraying and other fields of work needs.An effective barrier to the body static,can be used repeatedly. *With perfect collar and practical pocket,good ventilation,comfortable for wearing. *Two colors(blue&white)for your choice,five sizes(M L XL XXL XXXL)to meet the different needs of you,also suitable for different height of people. 1. The size chart above refers to clothing dimensions,not your body measurements. 2. If your measurements happen to be between two sizes, please choose the next bigger one. 4. The real color of the item may be slightly different from the pictures shown on website caused by many factors such as brightness of your monitor and light brightness.